Here some obvious rules I’ve learned over the years in my endeavor to build easy to use products. I thought about sharing this because I often have to remind people some of the points below when it comes to UX. If you desire your app to be simple and easy to use, start focusing on the one problem you want your app to solve, and make sure you’re doing an amazing job at it! While a solution usually takes several steps, try your best to reduce the number of steps. The Uber app for example, let you order a ride (or food) without having to pass through the annoying step of trying to hail a taxi in the street and the awkward moment of the payment. To hail a taxi, it’s easy you can do it wherever you are by a simple tap and there is no payment steps anymore since that’s automated at the end of the ride. No wonder why Uber users love it! I love it too. Let’s think about this a bit more. Isn’t it why humans have created machines? I think it all started with the motivation of automating annoying tasks and save ourselves some time, since this is the most valuable thing they have. Human beings are lazy by nature. You can think it as a flaw, I actually think it is one of our main source of creativity. Let’s take this even further. If you think about it, it’s pretty simple to make an easy app that people would love using. You don’t need to create a revolutionary social network; just find a common problem, look at how people solve it and optimise this process by a little enough for them to be willing to change their habits. I always laugh when wannabe entrepreneurs tell me “man! I wish I have an idea for an app”. You really must have a really easy life if you don’t encounter any problem every day. You want an example? Before Snapchat became Snapchat, the main product was just about exchanging pictures with someone you couldn’t be able to save on your phone. Snapchat was the solution to a very simple problem anyone have betwlinking trust and privacy. When the user lands on this screen what is he expecting to find and what is he should do next? Why? Make sure that at least 80% of the screen is used for the combination of the previous question’s answer. The 20% left, in my opinion should be used for navigation purposes and secondary options. Take what the user should do next, and make it the main call to action on the screen. If you are having troubles to define the main call to action on a screen, maybe it’s because you’re not looking at it with the user’s point of view. Try to deprioritise your company’s interests in favour for user’s interests. Then give a priority to each action the user would be willing to do. A simple way to prioritise action is to ask yourself: “How often will the user do this”. Best answer is to look at analytics, but if you don’t have access to user’s behaviour data or if your project hasn’t been released yet, then it’s okay to start with your own assumption as long as you record actions, will look into analytics and will optimise your UI after the first release. 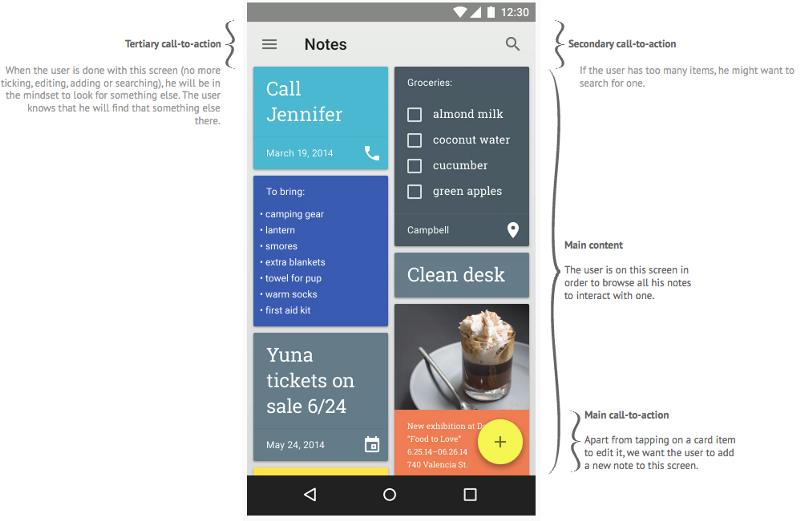 Let’s take the example of The Google Keep app, a todo/reminder list app to illustrate this and ask ourselves “What is it that the user is looking for doing when he opens the app“ (let’s assume he is an existing user). The first most popular scenario will be the user is looking for an existing note he wrote in the past. The second one is going to be the user desires to add a note. Those two scenarios are the most popular one and should really take most of the first screen displayed to the user when he opens the app. A less popular use-case scenario but still valid will be to look for an existing note that has been archived. Here a big question that I will talk about on another post since Dashboard vs Burger menu vs Tabs is a bit of a big controversy online.